Bassist and bandleader Charlie Haden has been involved in many strange projects. He spent his early days in the '60s as a player in Ornette Coleman free jazz band, followed by work in pianist Keith Jarrett’s American trio. His '70s work included gigging with Carla Bley in the experimental and political Liberation Music Orchestra, and one-off’s with fusion jazz guitarist John McLaughlin and avant-garde composer Yoko Ono. In the '80s and '90s, Haden performed with artists as different as Joni Mitchell, Ginger Baker, Bill Frisell, Chet Baker, and James Cotton. During the last decade, he's played with everybody from Ringo Starr and Elvis Costello to his own family members, originally a country band from Shenandoah, Iowa, where he began his musical career. Haden also has performed and recorded dreamy interpretations of jazz standards with his Quartet West for a quarter of a decade. The group has just recently issued its seventh release, this time with something different: six highly accomplished female vocalists. 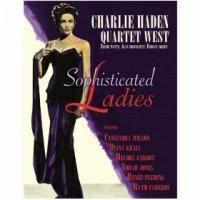 The core of Charlie Haden’s Quartet West includes Haden on bass, Alan Broadbent on piano/string arrangements, Ernie Watts on tenor sax, and new member Rodney Green on drums. This time they are joined by Cassandra Wilson, Diana Krall, Melody, Norah Jones, Renée Fleming, and Haden’s wife, Ruth Cameron. No wonder the disc is entitled Sophisticated Ladies. There’s a natural human tendency to try and rate these artists by comparing the songs and deciding which woman does the best job. If one were to rank the tracks on the disc from best to worst, the clear winner would be: Duke Ellington. The instrumental version of the title cut features a lush sax melody by Watts and Broadbant tickling the ivories with a sparkling touch. It is performed beautifully! That said, the vocalists do contribute quite a bit by their presence on the album. Melody Gardot offers a solemnly sweet take on Edgar Delange/Josef Myrow‘s “If I’m Lucky”. Norah Jones does a languid version of Harold Arlen’s “Ill Wind”. Cassandra Wilson plumbs the romantic depth of Johnny Mercer’s “My Love and I”. Ruth Cameron breezily croons Lew Brown’s “Let’s Call It a Day” as if she hadn’t a care in the world. Renée Fleming takes the opposite tack and richly emotes Ned Washington/Victor Young’s “A Love Like This”. And Diana Krall begins the weepy Gordon Jenkins composition “Goodbye” as an almost spoken word monologue that transforms into a swinging dirge about a love that died. But the ironic thing is that these distaff vocalists highlight just how good the instrumentalists are. On the six tracks in which they sing, one cannot help but notice just how tight the playing consistently is. And on the six tracks in which they do not, one hears just how note perfect the performers are. Each riff, every measure, comes off as impeccably done. Haden’s presence as bassist may not be the most audible feature on the disc, but the evidence here certainly shows that he commands the respect and effort of his band and guest vocalists. The music is consistently smooth and satisfying. If this album was a French pastry, we would all be eating desert for supper.